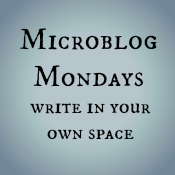 Last week I had a post all planned for Microblog Mondays. It was going to be about how I used to love September, how it used to be my favourite time of year, how much I used to love looking forward to the new school year. And then I was going to write about how I was dreading Tuesday, because it was the first day of school, and E’s first day of Grade One, and I was just.not.ready for another eight-week four month transition like we had with JK and SK. I wasn’t ready for the endless tears, the bargaining, the requests to stay home, the plaintive statements that school was “just too long” and he just missed me “so much”. I wasn’t ready for the phone calls from the teacher, the meetings after school, the behavioural charts. I wasn’t ready for the feeling that everyone else’s kid was getting it when mine just wasn’t. But Monday was Labour Day and we got busy and I never found time to write the post. And that, it turns out, was a good thing. He came out of the school at the end of the day bubbling over with excitement. Grade One had been fun! He had his own desk and his own pencil case! His teacher had told him she was amazed at how much French he knew! It’s just kept getting better. All week we had a few tears at drop off (because, as he told me, he finds drop off “so hard and scary”), but he was fine during the day. He’s been eating his lunch, despite now being in the lunchroom, “which is really really noisy and filled with like a gazillion kids”. He’s wanted to play in the playground after school every day, something which he almost never wanted to do last year. He loves that he can go anywhere he wants during recess. He loves that he has an agenda. His best friend is in the class, and they come up with crazy games to play on the field (“Mummy, this morning we made a dust storm!”), and he’s already playing with some of the other kids he was friendly with last year. To top it off, today he voluntarily went to school 45 minutes early because he wanted to try out for the cross country team. I’ve had no phone calls from the school, no notes from the teacher, no hand waving me over at pick up for a “brief chat”. My kid, it turns out, is rocking Grade One. I have never been happier to have been so wrong.